A collaboration can give an archival collection opportunities that a solo project cannot. The credit for success goes to no individual, but the cooperation reduces the chances of failure because many parties are determined to avoid that outcome. That dichotomy appears when evaluating two different websites that archive materials from Historically Black Colleges and Universities. The HBCU Library Alliance and the Charles W. Chesnutt Library Digitized Collection have disparities in funding that have affected their maintenance and exposure to broad audiences. However, it is the wealth of content, and the recognition of the ways to reach out, that have truly given one site the advantage over another in searchability, transcription/encoding and other capabilities. • Promote the mission of each university. • Preserve the history and culture of the institutions and community. • Provide access to valuable collections held by HBCU libraries and archives. 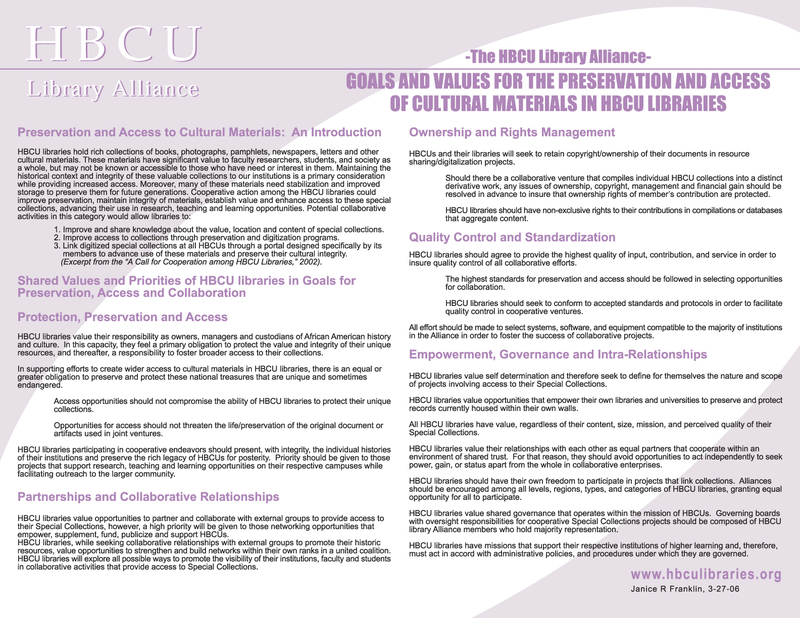 The scope of Materials at the HBCU library alliance has both breadth and depth. There are nineteen different schools that have contributed digitized items to the site. These include photographs, yearbook pages, and university bulletins. These range in date from the founding of the schools in the late 19th century to as recently as the 1970s. Not every school has works that span that entire time period, or the same amount of material. For example, Alabama State’s collection has twenty-one items all related to the founding of the school, whereas Fisk’s online collection has 508 documents that span two centuries. The content of the items ranges from pictures of sorority dances to famous guest lecturers to sports competitions. The Chesnutt materials consist of only several dozen items from one school, but the types of documents are more varied. Besides photographs and yearbooks, their digitized collection includes newspapers, brochures and college catalogs. Most of the material comes from the 20th century, but there is some information about the founders of the university and early campus life. There are posed pictures of student life, each page of many yearbooks and candid sports photographs. The creators of the HBCU Library Alliance are not the individual schools but rather an integrated electronic library. The Alliance functions as a result of a Mellon grant and is managed by Cornell University. HBCUs can join with their fellow institutions and pool their resources into this Alliance to 1) preserve their collections, 2) digitize them and 3) make them widely available to internet users. With that in mind, the target audience for both archives appears to be researchers, both academic and personal. There are few text-heavy documents, meaning that almost any age group that studies African American history (high school, university, post-graduate) has something to gain from these collections. The goals are key in determining who the creators want as part of their audience. “Visibility” suggests an external audience, those who may not have been aware of HBCUs and the rich collections therein. However “Networking” and “collaboration” suggests that the people who frequent and comprise the HBCUs are also a target audience of the Digital Collections creators. The students, faculty and alumni who can also gain from these materials, because they have increased access to parts of their own past through the Library Alliance. The creators of the Chesnutt’s digital collection are the archivists at Fayetteville State University Charles W. Chesnutt Library. In trying to be more specific, the "Contact Us" page links to the library administration, and the collections pages themselves link to one specific webmaster, who is affiliated with the University but whose exact connection is not clear. The funding for the project originally came from an Institute of Museum and Library Studies Grant and the project was administered by the State Library of North Carolina. Unlike the Library Alliance, however, this grouping of collections seems to have run out of funds to sustain it, which is why the Fayetteville collection appears isolated and unaffiliated. The parent site for NC ECHO (Exploring Cultural Heritage Online) appears vibrant and well-maintained, and lists Fayetteville in its Institutional Directory. However, Fayetteville’s contributions seem to have stopped in late 2004, while ECHO continues to grow. The funding appears to have gone towards creating and maintaining ECHO as a portal to all these sites, but Fayetteville’s Chesnutt library appears very much on its own. Given that the collection does not have its own URL but must be found through the University’s site suggests that the students, staff and alumni researchers are the primary audience for this archive, and there is little emphasis on trying to draw in users from outside the scope of the institution. Additionally, the lack of description connected to many of the digitized items suggests an insularity of purpose for the site. Users are expected to know about the founders or alumni based on their names and no other background information. Campus building photographs have some basic statistics such as when they were built and a link to a campus map. Nonetheless, the lack of interconnectedness suggest that the users for whom Fayetteville State University built this site would already know what they were searching for. The Library Alliance is very clear in outlining its values here. They take great pains to explain to users what the copyright situation is, and to potential member schools they reassure them of their rights and responsibilities they join. They also give their workflow and future plans for the documents and the collection as a whole. On an item level, each document has excellent hi-res scans, with the option to click on each one to zoom in on particular sections of the photo or document. This is done through ContentDm, a brand of digital management collection software. Everything is clear and accurately labeled. Additionally, each document has multiple views, where users can see the encoding on the document. Users can also manipulate the image in their browser by cropping, rotating or stretching it depending on the need. Each document is also attributed properly to the school and the proper archive. The treatment suggests that they are trying not to limit what users can do with the image, while at the same time making clear that the archives must approve of the way the image is being used when it is for public purpose. There is a lack of consistency when it comes to the ways to view the document. Some of the schools’ bulletins can be viewed as text files, or Page and text, while some cannot. The Chesnutt collection, on the other hand, has its own problems with consistency. It has hi-resolution scans for some of its documents, but not all. Like the Library Alliance, the hi-res images are JPEGs, but unlike the Alliance, there is no invitation to request hi-res scans, and no attribution of copyright or any contact info at all beyond a webmaster who may not still work there. All of the clubs and organizations photos link to better-quality images, but yearbooks, for instance, taper off after the first few years, as though the archive gave up on uploading them. With this archive, it seems as though the goal was to get through uploading something, without going back and concerning themselves with how to properly display them and give users an opportunity to interact with them. Since most are uploaded through html, it is unclear if there was any sort of process, let alone digital databases and metadata. They also allow for search fields that include Title, Subject, Description, etc. (For a full list look at the drop down menu here). The view text option highlights the search terms so that the user knows when they appear. However, the site would benefit if within the search options users could pick various categories of document (e.g. Bulletins, Yearbook photos, etc.) Searches for “dance”, for example bring up many issues of bulletins, where it is not immediately evident that there is even a search term within it. “None of the Words” mode helps eliminate some of the categories, if they are contained anywhere in the document, but this is not a permanent solution. A greater divide between reading material and graphic images would enhance their search function. Meanwhile Charles Chesnutt’s digital archive does not even contain a search engine, not even a simple Google box. This again points to the insularity of scope, and imagining only those affiliated with the University would ever frequent the site. However, the categories by which users can browse – although fewer modes than the Library Alliance – is simpler and easier to use. The site actually breaks down the content by category, allowing users to separate yearbooks from faculty photos and other important needs. While the site could benefit from having a minimal search function, the fact that the collection is so small at this moment makes the browsing categories very effective. Having used the Library Alliance as a source for graphics for an exhibition, I have found its content to be both intriguing and useful for institutions that are studying it, as well as for the casual researcher of African-American history. The blog, detailed mission statement and workflow outlines give users an insight into the process that adds to the site’s integrity. The multiple search options, encoding, and social networking capabilities add to the content-rich site. The only issue I have found is that failing to group the documents by type has prolonged searches where keywords appear too often. The Chesnutt Library inspires pity. Having researched African American Universities, there would seem to be a wealth of information that Fayetteville University could share on the Internet. It is a pity that the loss of motivation and/or financial support has rendered their archival collection mostly undigitized. With ECHO still in existence I wonder if reaching out to them with a renewed sense of purpose would yield any positive results. The site has excellent organization, but the fact that webmasters and archivists seem to have given up on generating content substantially decreases its value. The discrepancy is not all about the stylistic trappings. Establishing a web presence requires designers, and money but that does not necessarily mean every well-funded project will turn into the HBCU Library Alliance. No, the two sites here reflect different approaches to finding opportunities to export their intellectual property. The ones that loosen their hold content to join with stronger organizations find greater success. Both sites have the content, but only one really knows what to do with it!